Mary Mulvihill was a pioneering, outstanding exponent of science writing and broadcasting. She wrote and broadcast for a wide variety of media, on a vast range of science- and technology-related topics. Her work was marked by an insatiable curiosity about the natural world and the role of science in understanding it, and by a boundless imagination in telling stories about scientific explorations, both now and in the past. The Mary Mulvihill Award was established by the family and friends of the late Mary Mulvihill (1959–2015) to honour her memory and her work in science journalism, science communication and heritage and to promote her legacy. It administers and awards funds to support work that commemorates her work and its significance. 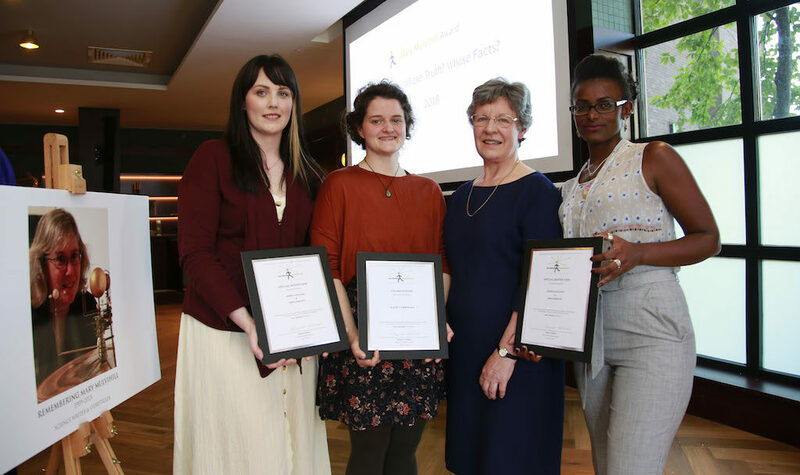 Siobhán Grayson, Katie Carbonara and Abeba Birhane (2018 Award Recipients) with Jocelyn Bell Burnell. The Mary Mulvihill Award of €2,000 is given for the entry to the annual competition that, in the judges’ view, best represents the curiosity, creativity and story-telling imagination that Mary Mulvihill showed in her work. Awards may also be made to other participants whose submissions the judges consider worthy of special recognition. 2019 award entries are invited on topics related to the theme ‘Science for the love of it’. Find out more about this year’s award. Stay up to date with announcements from the Mary Mulvihill Assoc and the award. © 2019	Mary Mulvihill Award.